BP has been an innovative leader in custom high tech sideloading solutions. The ML series offers a robust stabile platform to handle long and bulky loads in very narrow spaces. 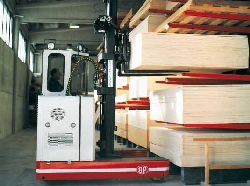 A conventional front counter-balanced forklift requires balancing the load, usually on a relatively narrow fork carriage. Sideloaders are suited to handle the load as a reach truck but then carry the unstable load on the vehicle chassis for extra support.